Now there is a nice pair of T Strap Sandals that are just made for summer. 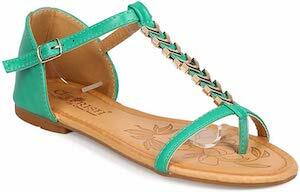 These sandals come in green, brown, black, and white so there are lots of colors to choose from and these summer shoes are just made for a visit to the beach. These sandals are flat with a t shaped strap design so that most of your feet are exposed to the sunshine. And these sandals look like they are made from leather but it is not real leather making these vegan and that just makes them even more perfect.